Our conservatory is having a revamp! 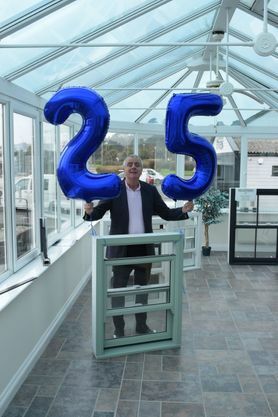 After more than twenty years good service we are replacing the conservatory at our Jelbert Way factory and showroom with a smart new anthracite grey one. Look out for it when you are passing, or pop in and see us when you are in the area. 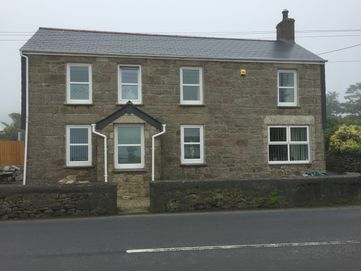 The two pictures on the right show the same property in Pendeen before and after we fitted new windows. The before picture (top) shows the house with white PVCu casement windows. These have been replaced with PVCu vertical sliding sash windows that better reflect the traditional style of the building. 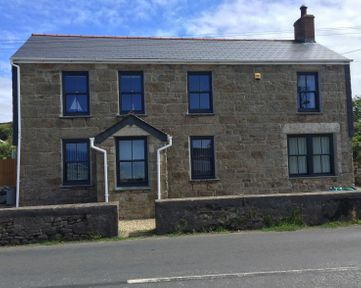 The new windows were manufactured in anthracite grey which suits the granite frontage of the house. 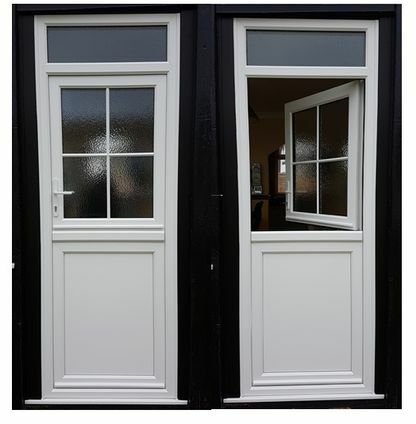 These two pictures show what a versatile option Stable Doors can be. The facility to open the top half independently gives ventilation while keeping the door securely shut. Our Aluminium Bi-fold doors are a great option for opening up your home to the outdoors. With a wide choice of colours you can be sure to find the right one to suit your property. Come along to our showroom - open six days a week. Proprietor John Elsey in his Jelbert Way showroom. Pro-Line is proud to celebrate it's 25th Anniversary on 1st April 2018. To share in the celebrations, every customer who places an order in April will receive wine or chocolates. OFFER EXTENDED to 31st May. 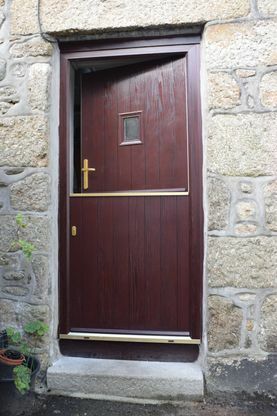 This Rosewood Composite Stable Door, recently installed by us in Newlyn, gives a practical and stylish option for a cottage. With a variety of styles to choose from, and a range of colours and glass options, you can customise your new door to suit you and your property. In a Conservation Area? No problem. We offer a free planning service too. 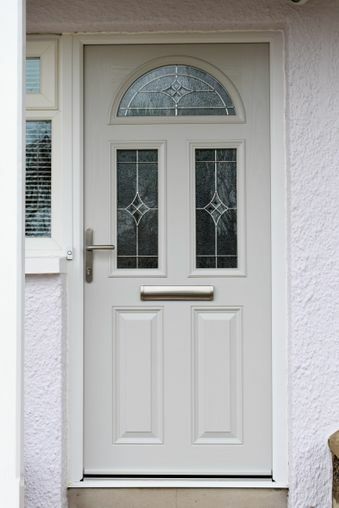 Composite Doors with traditional styling and a range of leaded and bevelled glass options are a great way to give your house a facelift. Choose from a standard classic colour or why not choose a bespoke colour such as this lovely Pearl Grey. 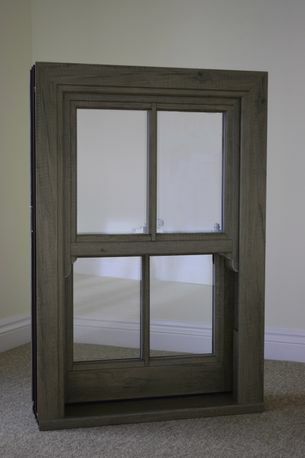 Introducing the very latest option in our comprehensive stable of sliding sash windows. On display now in our showroom. 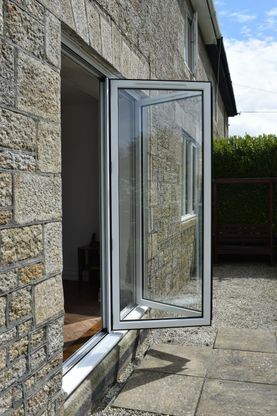 Contact us in Penzance, Cornwall, for more of our latest news on windows, doors and conservatories.